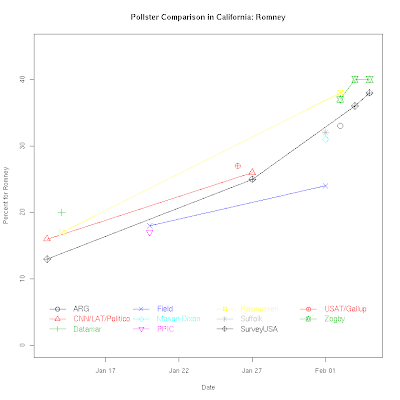 There is quite a bit of disagreement in the California polls, so let's do a Pollster Comparison to see who says what. 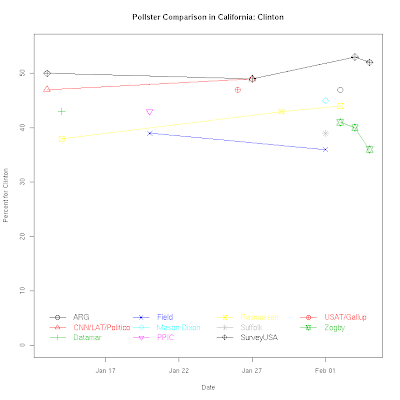 The Democratic race has the biggest gap across pollsters. Most see Clinton ahead, but disagree on how much the race has tightened. But Suffolk and Rasmussen put Obama just barely ahead in their final polls. And the big difference is in the Zogby/Reuters/C-SPAN poll that sees Obama not only ahead but expanding his lead to double digits. That gives us a range of results from Obama ahead by more than 10 to Clinton ahead by 10. Somebody is not quite right here. But who? And why? Across all the polls, Clinton is relatively flat while Obama has gained. 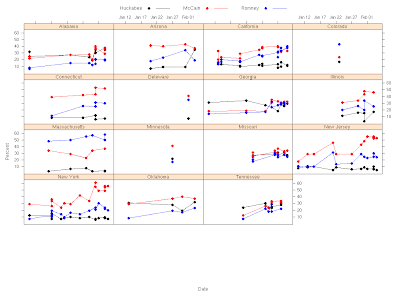 But looking at each poll and each candidate reveals more differences across pollsters. Both Zogby and the Field poll find some decline for Clinton while others have her flat or rising (SurveyUSA and Rasmussen). Everyone sees Obama either flat or rising, with no pollster (who has at least 2 polls) seeng Obama declining. 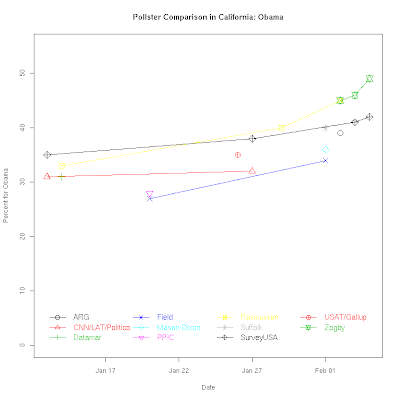 But the extent of the rise, and how high Obama's starting point was, differs quite a bit across pollsters. Survey USA and Rasmussen both see Obama gains, but SurveyUSA offsets that by measuring gains for Clinton as well, resulting in relatively little net change over their last three polls. Rasmussen, on the other hand, has Clinton gains but even bigger Obama gains, resulting in a net decline and a final poll with Obama just barely ahead. 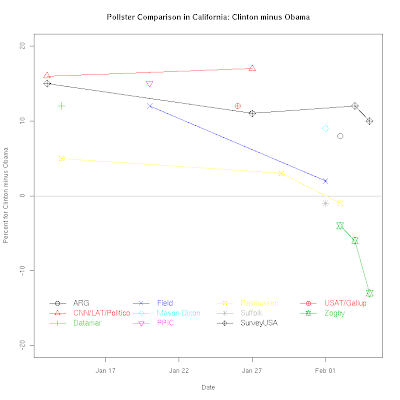 The Zogby polls in contrast find both Clinton declines AND Obama gains, making for a net change that strongly favors Obama and results in his 13 point lead in the final Zogby poll for California. On the Republican side, we also see substantial differences. Two pollsters see a dramatic tightening of the race. 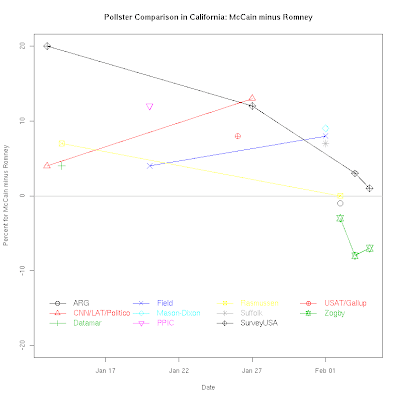 Rasmussen and SurveyUSA estimate that McCain's earlier lead has now collapsed to a dead heat. (A single ARG poll also sees a dead heat, but has no over time data for comparison of trend.) 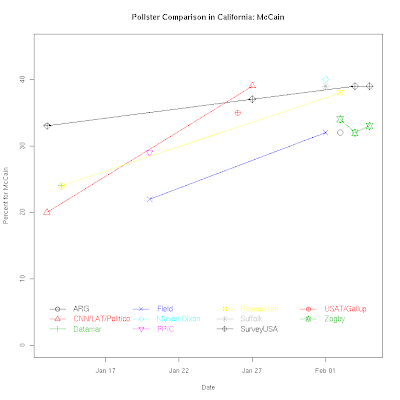 In contrast the LA Times/CNN/Politico and Field polls both find McCain gaining some ground in their polls. These two are a bit stale now, but showed gains even when Rasmussen and SurveyUSA saw declines, so this is not only a difference of survey dates. Zogby/Reuters/CSPAN is again quite different, finding Romney leading in all three polls and expanding his lead to high single-digits in the last two polls. Across the Republican polls, the differences are almost all matters of the degree of increase for both McCain and Romney. All polls agree that McCain has been increasing his support. But they also agree that Romney is rising sharply. The differences in net support have a lot to do with differing estimates of how fast and how far Romney has risen. Those with the greatest Romney rises have him catching McCain or leading him. Given the length of time it is likely to take to count the California vote, it may be Thursday before we know which of these polls was closer to the end result. Now that the first "Super" event of the week is over, time to turn to the next one. We've got a number of polls in several states, fewer polls in others. Here are the trends in the 17 states for which we have polls since January 1. In the Republican chart below, I've omitted Utah where Romney holds an 84-4 lead over McCain, according to the one Republican poll since January 1. Expanding the scale to include that data point makes it hard to see the differences in all the other states. 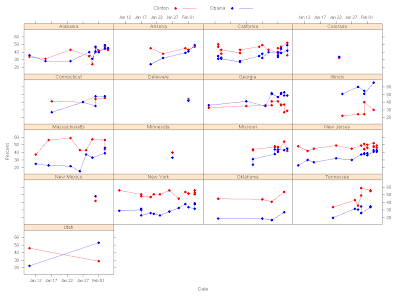 See the individual state charts at Pollster.com for trend estimates in the states with sufficient polling. Here, look at the data and reach your own conclusions. The data here are through Sunday. I'll update the charts Monday evening with the Monday polls.